Balasore was a bustling port established by British in 1642 and was an important maritime trading port also with Dutch and French, but lost its importance because the port had silted up in the 18th century. Ruins of some Dutch tombs and remnants of some old canals which led to the sea (13 km away) can still be seen. Today Balasore is a growing town, well connected to both Kolkata (298) and Bhubaneswar (214) by road on NH5 and by rail on the Kolkata-Chennai main line. It is a convenient base for visit the serene and calm beach resort of Chandipur, just 16 east of Balasore. The seaside resort of Chandipur is one of Orissa’s finest beaches. The musical sway of the Casuarinas trees and creepier white sand dunes add to its seductive beauty. Chandipur is one of the few breaches of the world where the sea recedes up to 5 km daily at low tide. Chasing the waves in a jeep, when the sea retreats is unforgettable. The serene and peaceful landscape of Chandipur captivates the visitors. 9 km from Balasore is the Khirachora Gopinath Temple at Remuna. This 19th century Vaishnava shrine is dedicated to Lord Krishna. Legend has it that Lord Rama (an incarnation of Lord Vishnu) in Treta Yuga during exile for 14 years in the mountains of Chitrakoot had inscribed an image on a piece of stone to show Sita his incarnation as Krishna (Sri Gopinath) in Dwapar Yuga. The king of Puri wished to bring this holy image, named Jay Gopal to Puri. One night the Jay Gopal appeared in a dream of the King and expressed his desire to however stay at a serene spot having herds of cow, which ultimately was identified as Remuna. Thus the image was enshrined here in a temple by the King Narasingha Deva of Puri. The temple as one of the important pilgrimage spots of Vaishnava sect got sanctified by the visits of Sri Chaitanya Mahaprabhu and his spiritual guru Sri Madhabendra Puri Goswami and also by Sri Rasikananda Deva Goswami, a devoted soul. Legend also has it that the Lord Gopinath once had to steal a pot containing Khira (Rice Pudding) for his staunch devotee Madhabendra Puri Goswami and thus he assumed the name Khirachora. With the Siddhashram of Madhabendra Puri Goswami, the Samadhi (the resting place) of Rasikananda Deva Goswami, the temple of Ramachandi (the village deity); Gradesaver Shiva and the river Saptaswara, all located here accord Remuna a high religious significance. A tranquil place with its captivating beauty in the lap of nature, Panchalingeswar is 30 km from Balasore. Its name is derived from the five lingams enshrined on a hill top. A place of pilgrimage for its five phallic emblems of Lord Shiva, it also offers a heavenly pleasure in the enchanting beauty of the Devgiri mountain range. A perennial spring here is the main attraction. The area is believed to be resided by Lord Rama for five days during the period of their exile, and the Sita supposedly enshrined these lingams to worship Lord Shiva. It is also identified with the Kingdom of Virat where the Pandavas lived in disguise during their exile and some associated it with the place where the King Jarasandha of Magadh built a fort in Ahuti Forest. Visitors come to enjoy the natural beauty of this hilly region. It is also famous for its two annual fairs, the nine days Magha Saptami Fair and Maha Shivratri or Jagar Fair in February/March. Some other places to visit around Panchalingeswar include the famous 14th-century Bhudhara Chandi Temple at Sajanagarh, the Jagannath Temple and the Kuldiha Elephant Sanctuary in Nilgiri. 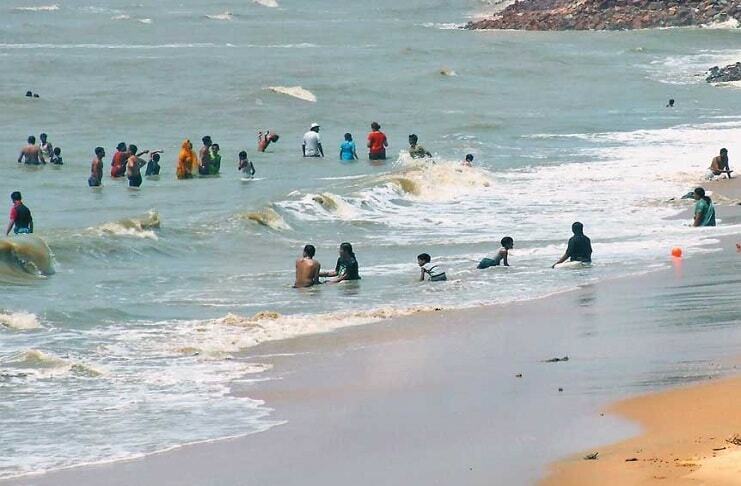 90 km from Balasore or 5 km from Chandaneswar, Talasari is the unexplored beautiful sea beach having its own ecstasy of natural landscapes. The district headquarter of Mayurbhanj, Baripada is the main commercial town of the northeastern Orissa. The terrain is thickly forested with hills, streams and the neatly thatched villages inhabited by large tribal population, especially Santal Tribe. There are a few time worn civic building erected by the local Maharajas (Kings) during the days of British. The area for centuries has been ruled by Bhanja Kings and their old palace is now a college on the main road. There are historic sites at Khiching and Haripur where these rulers have left their marks and some prehistoric sites at Kuchai and Kuliana in the district. The colourful tribal festivals and their handicrafts like cast metal toyas and sect images and the tassar silk of this district attract the visitors. Bripada is also the gateway to Simlipal National Park, about 50 km drive away. Bhubaneswar-Baripada is about 295 km. The town’s main attraction is the annual Rath Yatra in June/July associated with its Jagannath Temple, a small scale version of one that is at Puri. Its unique feature is that the Chariot of Subhadra-Lord’s sister is pulled only by women. Another colourful and vibrant annual show is the Chaitra Parba in April and it is a treat to watch tribal attired in fabulous dresses performing the vigorous Chhau dance. This dance was performed by the warriors in the past before they ventured into the battle grounds. Baripada has a small museum, exhibiting some fine sculptures, pottery, coins and other paraphernalia belonging to former Maharajas. 50 km west of Baripada, the Simlipal National Park is one of India’s first Project Tiger reserve. It boasts around 100 tigers and some impressive wildlife spread over its total area of 2750 sq. km. the entrances to the park are at Jashipur and at Pithabata, near Lulung. About 20 km west of Jashipur, Khiching was the capital of the Bhanja Kings between the 10th and 11th centuries. It is famous for its Kichakeswari Temple built entirely of chlorite slabs from the ruins of an original temple that stood here. The deity Kichakeswari was the family Goddess of the royal family of Mayurbhanj. The towering structure has superb images of several deities and the architecture of this reconstructed temple is inspired by a style prevalent in the 8th century. Nearby a number of temples built in Kalinga style still survive and are in use. The ruins of two forts of Bhanja dynasty and some Buddha images of archaeological importance have also been unearthed in this hamlet. The small Archaeological Museum preserves some outstanding life size statues of Shiva and Parvati and exquisite sculptural panels from some early age fallen temples. 16 km southeast of Bripada, Haripur was founded in 1400 as the capital by Maharaja Harihar of the Bhanja dynasty. It has the evocative ruins of some places and temples. The magnificent Rasikaraya Temple, an outstanding example of a brick-built monument is particularly noteworthy. Equally impressive are the ruins of the inner apartment of the queen, the Rani Hamsapur and of Darbar Hall with its beautiful carved stone columns and arches. Situated on the banks of Subarnarekha, the lingam of Baba Bhusandeswar is being worshipped for years in a remote village of Kumbhirgadi. Caved out of black granite, the lingam is about 3.8 m in height and 3.5 m in diameter, Asia’s largest, now housed in a temple constructed in 1984. Legend has it that to grant the wish of the demon King Ravana, Lord Shiva gave an atmalinga to him but warned that no one can remove the lingam from where it is placed once. When Ravana was carrying the lingam to Lanka from Kailash Mountain, he felt thirsty and asked a young shepherd to hold it, the boy put it down. On returning, in spite of all his strength, Ravana could not uproot the lingam and with every effort, its size kept on increasing. He returned to Lanka and since then it is enshrined here and being worshipped as Bhusandeswar.